The days may be shorter and the temperatures may be lower but, as you’ll see from our all our news, there’s no let up in the wonderful things that so many of our supporters do to help us. We thank you all and wish you a peaceful but very merry Christmas. 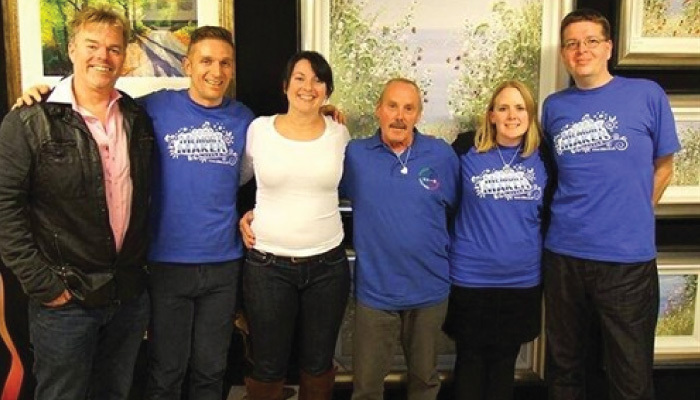 It may have been wet and blustery outside on the evening of Saturday 2 November but inside Haddon Galleries on Torquay harbourside there was lots of warm spirit and generosity at a special event which raised over £4,000 for the THHN. The gallery was open all day with artists Laura Wall and Mike Jackson painting and signing prints. Raffle tickets were on sale with some fantastic prizes up for grabs and in the evening the gallery became a party venue with some delicious nibbles and refreshments very kindly donated by Waitrose Torquay and music from great duo, Noteable. Then it was time for the auction which featured over 20 amazing lots all of which had been donated and which was very kindly overseen by auctioneer, Gerald Arnold. Another example of a group of people coming together and putting on a spectacular event to help us out. We are so grateful. We know that Christmas shopping is tough but, whilst you are trawling around the shops looking for inspiration, spare a thought for the wonderful Glen Bevan. Not only does he have all of his Christmas shopping to do but he’s in the throes of some incredibly gruelling training for an amazing challenge that he’ll be undertaking on 22 December at the Winners 2000 gym in Torquay where he works as a fitness instructor. And when we say amazing challenge, we really mean it. Consider this… how does cycling 25 kilometres and then running 5 kilometres sound? What about, if, once you had done that you did it again and again and again for 24 hours? That’s exactly what Glen is planning to do to raise money for us. Told you it was amazing. So, what can you do for Glen? Well, Glen has a Just Giving page set up at www.justgiving.com/Glen-Bevan. Or to donate by text simply text THHN75 and the amount to 70070. Glen is hoping for plenty of support on the day as well so if you’ve a bit of free time come on down and help to cheer him on and keep him awake! The challenge will last for 24 hours and Glen will only stop for occasional food and comfort breaks with a couple of leg massages along the way. For updates on how he’s doing on the day, stay tuned to our Facebook page. We are very excited to bring you news of a fantastic Variety Show that will be happening at Babbacombe Theatre on Friday 21 February. The hosts and producers, of what promises to be a fantastic night of entertainment, are London-based comedy duo Revan and Fennel, aka Rosie and Alice. Not only did they win the coveted Funny Women Variety Award for 2013 they have also appeared at various London theatres as well as the Brighton and Edinburgh Fringe Festivals. Alice hails from St Marychurch and when they heard about the work of the THHN they were determined to produce a fundraising variety night on our behalf. As well as Revan and Fennel themselves, the show will also feature extreme juggler and Britain’s Got Talent semi-finalist, Phil Blackmore, comedian and magician Stu Turner, slapstick male trio “Three Half Pints” and Tamar Broadbent, a multi-talented singer, composer and comedienne. The event is being sponsored by our great friends at Babbacombe Model Village and we are looking forward to the big night enormously. So, how do you get tickets? Book online at www.babbacombe-theatre.com or call 01803 328385 Prices are: Adults – £12.50, Seniors – £11.50, Children – £10.50, Family of 4 (2 adults, 2 children) – £40. See you there! Our latest Trustees Report and Financial Statements have now been published on our website and can be viewed at /media/48122/t39c_members__accounts.pdf Huge thanks to all of our supporters in helping us continue to grow and take the reach of our work further. How about buying something from our great clothing line? A nice new hoody or perhaps a polo shirt. Great pressie ideas that support us at the same time. Perfect! Or what about tickets to the Variety Show in February? What a treat. THHN Variety Show – Friday 21 February – see above. Plymouth Half Marathon – 27 April 2014. Don’t forget to let us know if you’d like to register an interest in running for us. Torbay Half Marathon – Sunday 29th June 2014. Don’t forget to let us know if you’d like to register an interest in running for us. Everyone involved with the Haddon Galleries event in November – absolutely brilliant. Colin from Riviera Mortgages who has embraced Movember beard-growing and is doing his bit to help raise some money for the THHN. Coastguard Cottage in Plymouth who welcomed their first THHN family this month. The family had been referred by North Devon Lifetime Services. Plus, a special thank you to volunteer Carolanne, who drove hampers and a welcome pack down to Plymouth. The Old Brewery in Ellacombe who held a party in the park for us and raised an amazing £208.45. Excellent work, thanks. Our wonderful catering suppliers including Riverford Home Delivery, Halletts the Bakers and Luscombes Butchers of Totnes. Everyone involved in the ongoing success of our Memory Maker caravan at Finlake Holiday Park which this month has been holiday home three times to families referred by the Cornish CLIC Sargent team. The Herald Express who gave Luke a great platform to tell his story and hopefully spread the word of the work of the THHN a bit further. The Buccaneer Inn who welcomed a family referred by the road safety charity, BRAKE. The lovely people at Pennywell Farm who held a magical nativity evening to raise funds for us – it really was a very special occasion. At the end of October THHN founder and Chairman, Luke, and his wife Suzanne became parents for the 4th time as they celebrated the birth of baby George. Congratulations to all the family from everyone at the THHN.